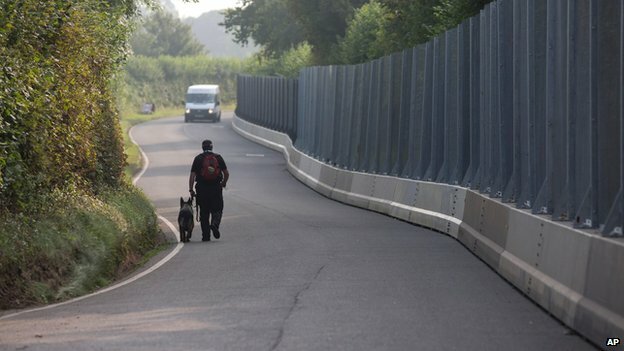 As a response to the increased numbers of people in Calais, the UK government has now approved giving the 9ft ‘ring of steel’ fence that was used during the NATO Summit in Wales this last week to further secure the Calais border. The fence, which was already coined the “Stalag Luft 12” during the NATO Summit, in reference to the high security Nazi Germany prisoner-of-war camps, is 12 miles long and was installed in Newport and to surround Cardiff City Centre to stop supposed ‘terrorist attacks’… And is now going to be re-purposed to try to stop immigration. Its an increasingly familiar story as the strategy and tools, surveillance systems and technologies, fuelled by governments and industries, in the name of ‘Security and Defence’ become more and more merged with those for ‘Immigration’.. until they become one and the same thing.